After two days at the Nike HQ in Beaverton (Portland), the teams coached by Ernesto Valverde and Fran Sánchez arrived Thursday night in Los Angeles. The Californian city has been waiting with open arms for the arrival of the blaugrana party and some of its most famous buildings have been lit up in the Club’s colours and with the badge in readiness for FC Barcelona’s visit to the city. The Public Library, the Museum of Art, the ‘Venice’ sign at Venice Beach, the Los Angeles Memorial Coliseum, the Petersen Automotive Museum, Union Station and the Rose Bowl stadium were some of the iconic buildings in Los Angeles chosen to symbolise FC Barcelona’s stay in the city of the stars. In all cases, a light projection and the Club badge were blended together with the blaugrana colours as the main attraction. 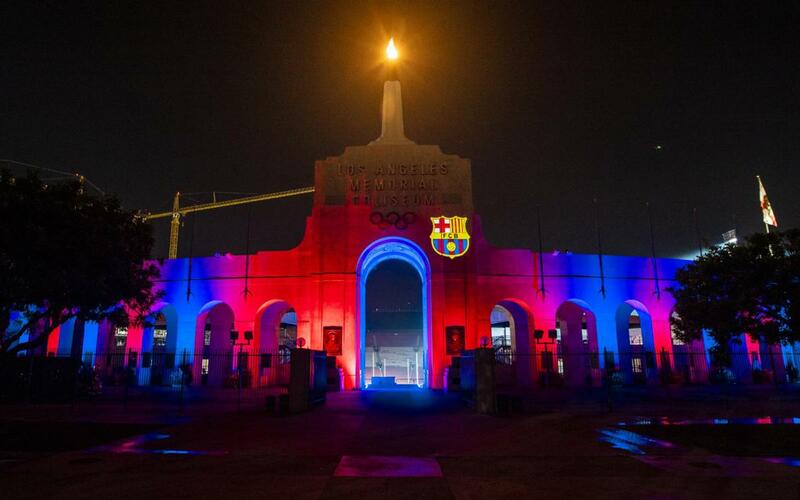 This is not the first time that a building in the US has been lit up in the Barça colours. Back in 2016, to coincide with the opening of the FC Barcelona office in New York, the top part of the Empire State Building, one of the most iconic skyscrapers in the world, was bathed in blaugrana to create one of the most memorable images in the Club’s history. In Los Angeles, the football first team will begin their International Champions Cup (ICC) campaign against Mauricio Pochettino’s Tottenham Hotspur. The competition is organised by Relevant Sport and it brings together the best teams in the world at locations around the world. Last season Barça took part in the competition in the games played on the East Coast of the USA and they were crowned champions after overcoming Manchester United, Juventus and Real Madrid. In the current edition with is taking place on the West Coast of the country, the blaugranes will face Tottenham, Roma (Dallas) and AC Milan (San Francisco). The game against the Premier League club will take place on Saturday 28 July at 8.05pm local time in Pasadena's Rose Bowl Stadium, a ground that holds 90,000 fans and is the home of MLS club the Los Angeles Galaxy. With regards to the women’s team, they face their first friendly of the pre-season with a game against Women’s Premier League Soccer League team SoCal FC. The match will be played on Saturday 28 July at 10.00am local time at the Drake Stadium which has a capacity of 10,000. The contest will be the first chance to see new signings Stefanie Van der Gragt, Kheira Hamraoui, Pamela Tajonar and Andrea Pereira.